One morning when I was in Los Angeles, California, the Spirit of God moved upon me and began to reveal to me about the covenant He has made with His people. God’s got a gospel that will produce victory, and you’ll get the victory through Christ Jesus. Do you understand that? You’ll get the victory through prayer and through faith in Him. He went on, “I will prove Myself in this next service by My power through barren women. I want to use them as an example in the service. I could use anyone or anything for an example, but because I want them all to have the victory I will use them. I want them to realize that I promised victory to every human being on earth that will give Me time in praise and give Me time in worship. Any human being, any denomination or any church that will not break the covenant I have made with them can have anything they want.”People everywhere are trying to do this and trying to do that, but they don’t spend any time worshipping and praising God. They have a lot of problems and want a bunch of things from God, but they need to enter a different realm of dedication towards God than what they’ve known. Thank God for all that they already know, but God is saying they need to enter a different realm of dedication, a realm of praise and worship unto God daily. After God said those things to me about what He wanted to do in that meeting, I did as He said. I asked for all the barren women to come down front, and they did. They began to come and worship God all around the altar in that big church. As we worshipped Him, the Spirit of God came down upon us in a mighty way, and the glory of God filled that sanctuary. God will give barren women a new womb if they need one. But even before that part of the service, there was a time of real worship and praise. That’s when a spirit of prophecy came forth, and the word of the Lord was spoken. You know, when that happens, the Holy Spirit can read your sermon to a congregation. He can tell them your sermon before you’ve even said a word! The man who was used by God to share that word of prophecy didn’t know anything about what I was going to speak on. I hadn’t said anything yet. I hadn’t called the barren women down front. I hadn’t told them anything about the covenant that God had said He made with the human race. But that was spoken out in prophecy. I want to share this word from the Lord that the man spoke in that meeting with you. Pay close attention to what He says about His covenant with us.”As Adam walked with Me in the Garden,” says the Spirit of the living God, “so I would have a people who would call out unto Me and cry unto Me and worship Me,” saith the Spirit of Grace. And the Lord says, “Do not seek for revival and do not look for a breakthrough, but look for the King of Kings and look for Me, saith the Spirit, for I Myself shall visit you,” saith the Lord. “I will not send a revival, but I Myself will come, for I am looking and searching throughout the earth,” saith the Lord. “I am looking for a people who will worship. Me in spirit and in truth, who will dedicate and consecrate themselves to Me,” saith the Lord. “I am waiting for a generation of people who will come before Me with clean hands and a pure heart, who will worship and serve Me only and bow down to no other god,” saith the Lord. “I am waiting for a people who will cry unto Me and draw nigh unto Me, for I am longing to manifest My glory,” saith the Lord, “and let the lightning bolts of My thunder come forth,” saith the Spirit. “Oh, My people, if you would make a covenant of praise with Me and make a covenant of worship with Me,” saith the Lord, “even if any shall come up with Me,” saith the Spirit, “you shall transcend the law of sin and death,” saith the Lord. “You shall rise up in My power and glory, and I shall have a people who shall walk in dynamic power, who shall walk with authority,” saith the Lord, “for the earth is Mine and the fullness thereof, and it doesn’t belong to the Devil. He doesn’t own anything,” saith the Lord. “So rise up, My people, and enter into a covenant with Me and worship Me,” saith the Lord, “and praise Me,” saith the Spirit, “for I have an atmosphere created upon this earth that will drive the demons away,” saith the Lord, “that My glory might be revealed. “Oh, My people, feel My presence, experience My majesty. For it’s a taste of what is to come where I shall pour out My glory in the days ahead, and the finest hour shall come,” saith the Lord. “Therefore, know, and know this surely,” saith the Spirit, “you are the people I have chosen, and I have ordained this place to worship Me and to praise Me with My creative power,” saith the Spirit of God. Now read closely. God made a covenant with the human race. You are human, aren’t you? Then He’s made a covenant with you! But you must choose to worship Him and give Him praise. After hearing a word like that from the Spirit of God, you really need to praise Him and worship Him! “I praise You, Jesus. I love You, Lord. 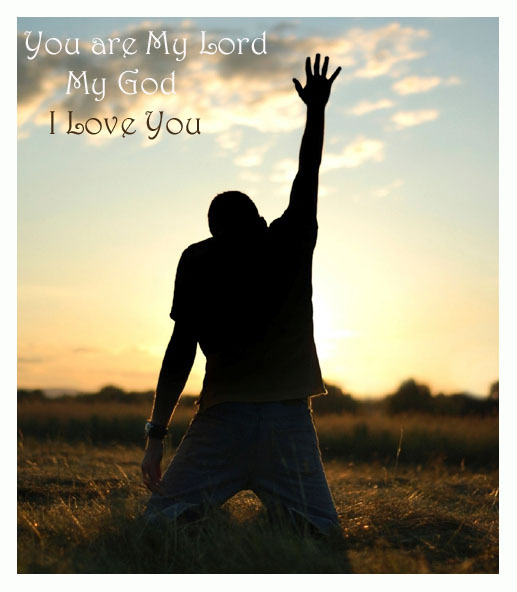 You are my Lord and my God. Blessed be the name of the Lord God forever! I worship You and I praise You, O Lord God. I praise Thy wonderful name. Thank You, Lord. You are the true and living God. “Oh, God, I make a covenant with You that I will praise the name of Jesus, and I shall worship You all the days that I live. Make this time of worship a part of you, just like your right arm is a part of you and your left arm is a part of you. Set aside a time of worship and praise unto God. Praise Him for a while, then worship Him. Praise Him and worship Him. You know, if you don’t ever worship God and praise Him, you are, very simply, out of God’s will. “What do you mean, Brother Norvel, when you say we are ‘out of God’s will’?” You may say, “I go to church and love the Lord. I am not out of God’s will.”You may not think so, but you are living beneath your means. You are living afar off—far off from where you could be living. But if you only worship during a church service and only get blessed when you sing those songs in church, you are not really worshipping Him the way He wants you to. And you will never be able to enjoy God’s best. You see, if you’ve not been spending time worshipping God yourself, you’ve been living your life in the permissive will of God. But all you have to have, my friend, is dedication to come back to Him. This is your own choice. You have to make the decision to return to God and begin to worship Him. Then you have a right to pray and ask God for things. If you are trying to pray and ask God for a lot of things without ever worshipping Him, you will usually get a few things just because He loves you so much. But always remember this: many things you will never get unless you yourself make a covenant with God. Many of the blessings of God that He has for a human being—or the human race, or the Church—will never come to you unless you make that covenant of worship and covenant of praise with Him. Many of those blessings, you will never get. Never! Well, all that sounds good, but it sounds religious, and that’s about what it is. I’m not talking about being religious. I’m talking about having a relationship with God. We are the Church of the Lord Jesus Christ, and Jesus is Head of the Church. If you will just tell God how much you need His Son to help you, He will. All you have to do is be willing to give yourself over completely to God. Look at some other Scripture verses about worship and praise. God’s people shall praise and glorify His name forever and ever—for as long as we have breath, as long as we shall live. That is forever and ever! Yes, you may be in trouble. Praise and worship God. You may be broke. I’ve been broke before, so I know what it is like. Praise and worship God. “If he catches cold, he will die.” But I’ll have you know I’m alive today! While I was in Florida one time, God gave me a vision of the day I was born. The people I was with and I had been in intercession, and as we were praying, the Spirit of God came all over me, and I fell over on the couch all of a sudden. That is when God began to give me a vision on the wall. It was like a movie screen in front of me. He let me see myself from the time I was a baby. He showed me everything that had ever happened to me. That vision made me appreciate what it meant to be loved by God. Every day I thank Him and praise Him and worship Him so much for all that He means to me. Parents, do like my mother did for me and give your children over to Jesus. Promise God that you will dedicate your children to Him like my mother dedicated me. I promise you, God can meet you there and make a difference in the lives of your kids. If necessary, He will perform a miracle for you—a miracle! It makes no difference what kind of miracle. He can do it if you need one. Jesus is the miracle worker. He wants you to have God’s best. Just remember to worship Him. Why? Because He is worthy of praise and worship. Oh, worship God in His holiness, not in doctrines. Just worship God in His holiness. Start worshipping the Lord and praising Him, giving yourself over to Him. Start telling Jesus how much you love Him. If you are married, but haven’t been able to bear children, give that over to Him now. Just start telling Jesus how you feel. Say, “Lord, in Your time I want to bear children.” I promise you that God will not leave you barren. You don’t have to be barren. Put your eyes on Him as your Provider, and give your future children over to Him. There is no use in waiting until you are expecting a baby. Give that little one over to Him now before you ever conceive it. The Lord God performs miracles like that all the time. It is no problem for Him to do that. “Well, Brother Norvel, the doctor says there is something wrong with my womb,” someone may say. That doesn’t make any difference. The Holy Ghost can give you a new womb if you need one. He can straighten out all your inward parts. Just keep worshipping the Lord and praising Him; keep talking to Him. The Spirit of God will come upon you and minister to you. The Holy Spirit is precious. Don’t be ashamed. Tell God what you need from Him. Tell Him now, and just throw that need over on Him. Don’t you carry it around. You take that need to Him, and let Him have it. You take the undefeated things about your life to Him, and lay them on the altar. Leave them at His feet. “Thank You, Jesus, for loving me. I don’t want all these problems, Lord. They are about to drive me nuts, so I give them over to You. I don’t want them, and I’m not going to have them, so I just give them to You, Jesus. covenant. I can tell you that now. We are the ones who have broken the covenant, not God. Him and worship Him, you will come on into the abundant life that will set you free. “Will God do it for me?” you may say. God wants to bless you. He wants to meet all your needs and give you the desires of your heart. Anything that God does for me, He wants to do for you. Anything God does for anybody else, He wants to do for you, too. Understand that! God will do it for you, but remember: without the covenant of praising His name and worshipping Him, without the covenant going from you to Him, you are breaking the covenant. God wants to bless you abundantly, and Jesus paid the price for you to have those blessings. If you have accepted Jesus, but are not keeping the covenant of worship and praise, you won’t be receiving the abundant life God wants for you. Oh, you will receive blessings in church, and you will receive some things from God, but there will be many, many things that your life will be lacking. They just will not come your way unless you make that covenant of praise and covenant of worship with Him. praise your heart can muster. He is ready to receive it this very moment. Then when you pray, the answers will come. And He’ll do great and mighty things for you!